Great news! Another sustainable way to get to the festival! Local cycle tourist Darren Hoad (the beardy biker) will be leading this year’s cycle ride to the festival from Bath and Bristol. Experienced in cycle mechanics and repair, Darren has led many rides in his 40 years of cycling with a range of groups from the young to the old, the inexperienced to fellow veterans. Darren will lead the ride from Bath (early start, Thursday 1st August) via Bristol (join the ride at Bristol Temple Meads railway station) to Chepstow… arriving at the festival Thursday afternoon. The ride will follow recognised cycle paths and cycle lanes which are mostly flat. Stopping for a lunch or picnic break along the way, the group will cross the Severn Bridge then drop downhill to the festival site. All done at a leisurely pace to get you there safely and enjoyably. The road worthiness of your bicycle and your decision whether to wear a helmet are your responsibility. 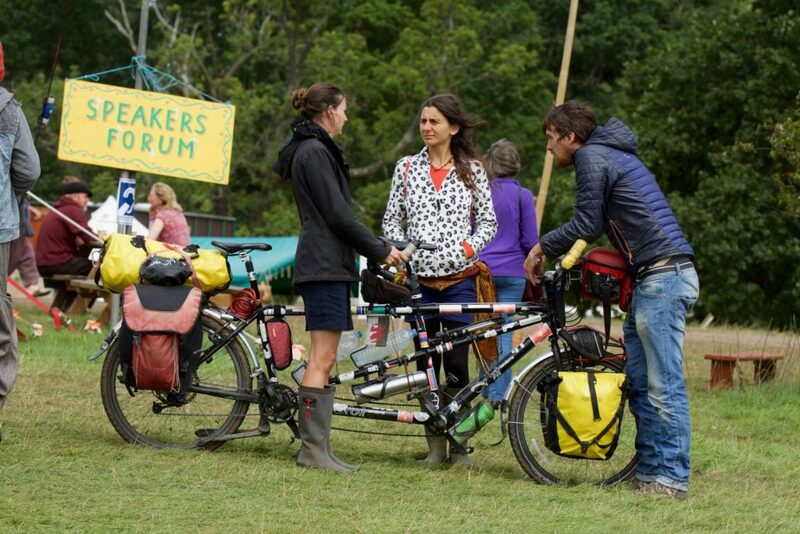 Darren is not guiding professionally and is not employed by The Green Gathering, he’s simply an enthusiastic festival-going cyclist who’s volunteered to create meeting points and a route. While you don’t need a racing bike and lycra, you will need a reasonable level of fitness and cycling proficiency to complete the ride. Thursday & Friday use Lion Gate entrance & box office – Racecourse Route onto site. Saturday & Sunday use Car Park entrance & box office – Racecourse Route onto site. …whichever day you arrive, you’ll be able to jump on our free shuttle bus between the festival carpark and main box office and get dropped off near the camping fields, though there may be a wait for this. If you choose to walk up our steep woodland track to the camping fields rather than take the shuttle bus, the most convenient route will be through Lion Gate (yes, a gate with stone lions). Be aware that vehicles also use this route. On Thursday and Friday there will be a box office for pedestrians at Lion Gate; if you arrive Saturday or Sunday you’ll need to use the box office in the carpark which is some distance from the Woodland Route.